Add word to your vocab list. Lots of examples that invite you to learn other words. Your website has caught our attention here at nciku and we would like to say “Thanks” for the plug. It would be great if you guys can really examine us and let us know what you guys think of nciku. We pride ourselves on being “More than a dictionary” and hope its like that for everyone! Once again, Thanks! Just wanted to mention to your response that you can search entire sentences selecting the “sentence radio button” on the search bar of nciku. Also we have a great toolbar for firefox which can be downloaded from our “tools” section. We haven’t had too much complaints with it, so check it out! Dustin: I don’t see the sentence radio button? Will check out the Firefox plugin. Wow, what an awesome resource for students of Chinese. 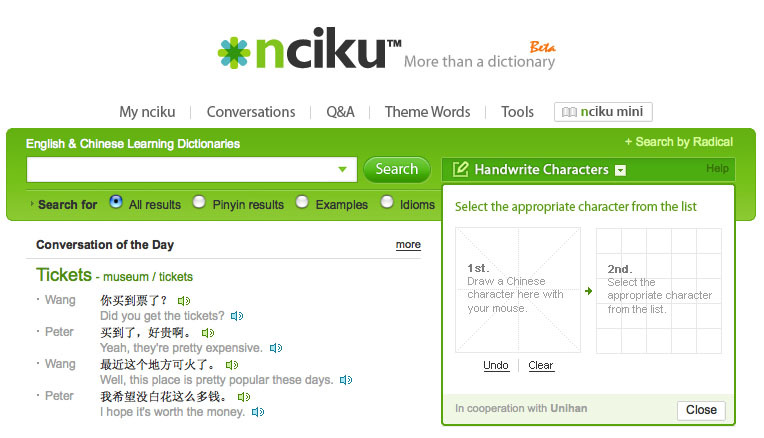 Thanks for pointing out nciku…best thing since Wenlin!